Meet these people who so love the bees in Australia! 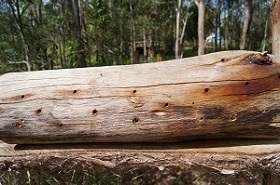 While I was vacationing in Brisbane, Australia last year, December, I was introduced to a special beekeeping club that served its local community (no specific names of individuals will be mentioned here). And perhaps because it was never planned, the unexpected brief encounter turned out to be many times more precious and rewarding for me. Its members immediately stood out to me because they were not the usual beekeepers that most honey enthusiasts would expect. Bees, for them are much more than just insects that give us honey to eat, but important pollinators for vegetables, fruits and nuts. To them, bees have an extremely vital role in the environment. 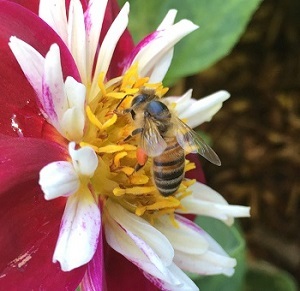 Two-thirds of Australia's food crops are dependent on insect for pollination. The efforts these guys put into maintaining bees as part of their environment were amazing. Different types of habitats for different types of bees were created in their own garden. I have never seen people with such a strong sense of respect for bees as pollinators and so eager to share their passion to care, nurture and protect the bees from diseases, pests and chemicals. 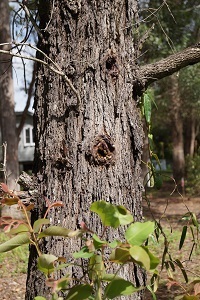 They were not just concerned about the thriving of honeybees, but also stingless bees and solitary bees. "Anyone can do their part in creating conditions to attract bees in the area they live" was their firm belief. Gentlest Beekeepers: They were the gentlest beekeepers I have ever met. How slowly they approached the bees and how carefully they handled them showed how much respect they had for these little creatures. 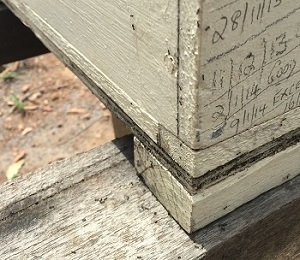 When shifting and taking the honeycomb frames in and out of the chamber and covering the lid, they went to great lengths to avoid crushing or rolling over the bees in the process. Fast or sudden movements could also annoy the bees and cause them to sting, so I was told. Unlike honeybees, solitary bees lay eggs in a wide range of diverse habitats. 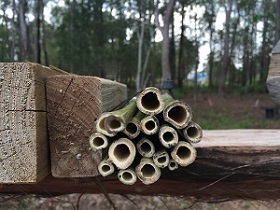 These guys make bee walls for these solitary bees from a variety of different materials eg bamboo, clay, wood and reeds. 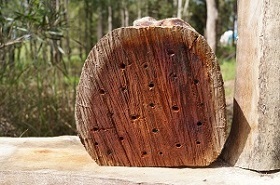 Interestingly, I was told that each bee species has their own preference for material, diameter and length of holes and tunnels. 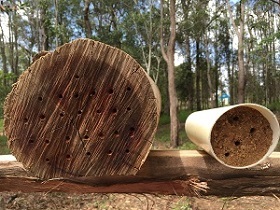 Nectar and pollen are brought into each of the tunnel compartment where a single egg is then laid. The egg hatches into a larva which becomes a pupa, and then finally emerges as a bee. And the life cycle repeats. It was too difficult to ignore the furious buzz coming from a hive of wild aggressive bees on of the trees near where the bee walls were situated. I was told that just not too long ago, the bees had attacked some workers who were busy working at a nearby construction site. Why? Possibly, they were irritated (or intimidated?) by their high-pitched machinery noise and their strong body odor on their sweaty bodies. Bees tend to fly in straight lines, (hence the phrase "to make a beeline"), so if you have panicky neighbors who are afraid of bees, placing fence or barrier in the bee's path as it leaves the hives to forage can help redirect bees' flight pattern and force them to fly high enough to avoid crossing the path of people below. In our "Pure Honey Test" page, many honey lovers and even some beekeepers (or at least they claimed to be) suggested that ants would not touch honey, so honey rejected by ants is pure, whereas honey that attracts ants is impure. But I saw with my own eyes black ants trying to get into one of the bee hives own by the group and was told that those black ants love honey. And to my surprise, sometimes an army of ants can even be mighty enough to loot the honey and pollen, attack and the brood, and eventually cause the bees to abscond the colony! Never knew ants could bring such damage to the honeybees! 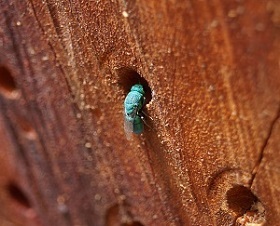 A luminous green insect was spotted burrowing into the tiny hollow of a wooden block. We were not sure what it was; green orchid bee or a cuckoo wasp? Whatever it was, it was a rare interesting sighting! Enjoy my collection of albums containing my favourite honey bees images from different countries: My Honey Bees Images. End of "Attracting Bees in Australia". Back to My Honey Bees Images..